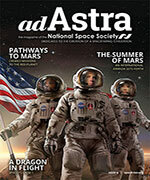 The Concept of Space-Based Manufacturing Facilities. Gerard K. O’Neill, Princeton University. Abstract: In 1969, I explored the possibility of providing all the needs of a technological civilization within habitats in space that could be built as rotating pressure vessels of moderate mass. The first calculations gave surprising results: within the limits of existing materials, such habitats could be as large as several kilometers in diameter, with several hundred square kilometers of internal surface area at an Earth-normal gravity obtained by rotation. Late in 1972 I began to explore in more detail how the first space settlement, and the beginnings of industry in space, might be established. I considered the Moon as the most likely source of materials. During 1972-1974, I looked for economical ways to transport material from the lunar surface to free space, which led to the idea of using a linear electromagnetic accelerator which I called a “mass-driver.” The mass driver seemed to combine the three essential characteristics of an efficient launching device: acceleration, guidance without significant friction, and recycling rather than loss of any expensive components. After transport, the second basic issue in the space-manufacturing concept is the processing of materials either into pure elements or compounds. In the case of lunar materials the question of whether to process on the lunar surface or in space has been considered in considerable detail. The conclusion was to process in space for reasons presented. 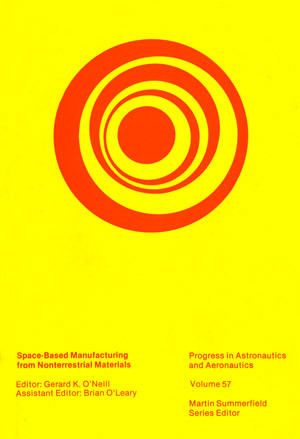 The three fundamental problems identified by 1976 as most urgent for the development of space-based manufacturing are explored in detail in the papers of this volume: transport, materials processing, and overall systems analysis. Trajectory Analysis for Material Transfer from the Moon to a Space Manufacturing Facility. 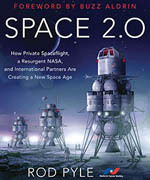 Brian O’Leary, Princeton University; T. A. Heppenheimer, Center for Space Science, David Kaplan, University of Michigan. Abstract: We present the results of three-body calculations of trajectories of lunar materials launched by mass driver from the moon to L2 and from L2 to convenient space-manufacturing sites By choosing a critical launch longitude along the lunar equator (33.1°E) for a certain class of trajectories to L2, it is possible to minimize the dispersion such that a miss distance of lunar materials at L2 of 50 m would result from launch velocity errors of about 10 cm/sec along the track, 1 mm/sec vertically, and 1 cm/sec laterally. The maximum acceleration requirement for the mass catcher to follow lunar librations is 1.5 x 10-4 m/sec2, plus modest additional stationkeeping with respect to the local force field. We describe a stable orbit for the space-manufacturing facility for which the AV requirements from L2 are 10-30 m/sec. The orbit would have a period of one-half the moon’s and would have lower AV requirements for transport to and from geosynchronous and low Earth orbit than would other candidate sites. Electromagnetic Mass Drivers. F. Chilton, Science Applications Inc.; B. Hibbs, California Institute of Technology; H. Kolm, Massachusetts Institute of Technology; G. K. O’Neill and J. Phillips, Princeton University. Abstract: A system based on standard electromagnetic theory has been designed for the efficient conversion of electrical energy into the kinetic energy of payloads of substantial mass (>10 kg) expelled at a rate of several Hertz. This “mass-driver” concept combines dynamic magnetic levitation for payload guidance, a feedback stabilized linear synchronous motor for acceleration, and the use of recirculating payload-carriers (“buckets”). These are passive objects containing superconducting coils. The calculated energy-conversion efficiency is about 90%. We examine thrust calculations, electric circuits, dynamic stability, and bucket design in detail. We find that accelerations much higher than first anticipated are practical (up to >100 g) and that a high-performance system can be designed on the basis of superconducting wire, silicon-controlled rectifiers, and other materials, all of which are available commercially at the present time. Because the buckets do not contact their supporting guideway, and their lift/drag ratio increases with higher speed, payload velocity appears limited only by total structure length. The system should have long life with little maintenance. A mass driver of 1000 tons mass (excluding power supply) is calculated to accelerate 600,000 tons/yr of material to 2400 m/s, at an efficiency of 92%. Mass Driver Applications. F. Chilton, Science Applications Inc.; B. Hibbs, California Institute of Technology; H. Kolm, Massachusetts Institute of Technology; G. K. O’Neill and J. Phillips, Princeton University. Abstract: The mass-optimization equations applicable to all mass drivers are derived, the economics of mass acceleration are considered, and designs are obtained in some detail for three reference tasks: the launching of material from the surface of the moon into free space, the transfer of large payloads (example: 83,000 tons) between orbits separated by 2000 m/sec in velocity interval, and the transfer of a 100,000-metric ton payload from low Earth orbit over the 4300-m/sec velocity interval to geosynchronous or higher orbit. We conclude that for each of these tasks the major cost would be the amortization of the mass-driver construction and its initial emplacement, and that the amortized cost for each task should be of the order of $1/kg of payload transferred. All three of the mass drivers considered in this paper could be designed in detail and constructed within the limits of present-day technology and normal engineering practice, and with materials now available commercially. We conclude with an outline of a suggested development program for mass drivers. An Appendix summarizes the more than 50-yr history of dynamic magnetic levitation and the linear synchronous motor. Lunar Resources and Their Utilization. William C. Phinney, NASA-Johnson Space Center; David Criswell, Lunar Science Institute; Eric Drexler, Massachusetts Institute of Technology; James Garmirian, Hope College. Abstract: Lunar surface materials offer a source of raw materials for space processing to produce structural metals, oxygen, silicon, glass, and ceramic products. Significant differences exist, however, between lunar surface materials in the highlands and those in the maria. In the highlands, the soil depth is at least an order of magnitude greater, Al:Fe is 10 times greater, the content of plagioclase (CaAl2Si2O8) as a source of clear glass is three times as great, and the content of Ti is at least an order of magnitude lower. Bulk lunar soil can be utilized for fiberglass and ceramic products. Evaluation of the extractive metallurgy and chemical operations associated with carbothermic and silicothermic refinement of lunar regolith suggests that Fe, A1, Si, Mg, and probably Ti, Cr, and Mn can be recovered, whereas oxygen is produced as a byproduct. An appendix describes the use of lunar materials for payload packaging suitable for mass-driver launching of lunar raw materials from the moon to a space-based processing facility. The existence of multiple paths and of analogies to past industrial practice gives high confidence of feasibility. A conservative plant design yields its own mass in oxygen, silicon, and structural metals in less than six days. Power requirements for a throughput of 300,000 tons/yr is less than 500 MW. The processing is done more economically in space than on the lunar surface. Establishment of a Space Manufacturing Facility. Gerald W. Driggers, Science Applications; Jonathan E. Newman, Amherst College. Abstract: A scenario leading to the establishment of a Space Manufacturing Facility (SMF) with a production rate of five Solar Power Satellites (SPS’s) per year (10 GW each) was developed. Preliminary cost comparisons defined the system elements and their interrelationships. It was estimated that the SPS’s would be 90% producible from lunar materials. The mass for other system elements (the Lunar base, from which lunar surface materials are mined and catapulted into space by means of an electromagnetic mass-driver; the SMF, an end-to-end system which fabricates sections and components of structures ready for final assembly from lunar raw materials; and all the requisite transportation elements) is Earth-supplied. The habitat housing the 6,500 workers, who will construct the SPS’s at the L5 construction site, was assumed to be constructible from lunar materials. An approach involving application only of present Earth-based technology leads to a design intended primarily as a proof-of-concept. Results are thus considered conservative. Three programs schedules, leading to the 5 per year SPS production goal by 2003, 2000, and 1996, respectively, were prepared. The projected cost to establish and operate the system until 20 SPS’s are in operation is nominally $155.1 B with an uncertainty range from $102.5 to $207.4 B. Appendix: Maximum-Strength, Minimum-Mass Structures. G. K. O’Neill, Princeton University. Abstract: The purpose of this paper is to examine a class of structures suitable to efficient cosmic-ray shielding, and which provide maximum usable land area with minimum mass, both structural and atmospheric. Esthetic considerations are secondary rather than primary in such designs and can be assessed in a quantitative way by quoting such parameters as sight lines, maximum unobstructed areas, etc., each with its price in structural or atmospheric mass. In keeping with the current trend of the space-manufacturing studies, emphasis will be on parametric formulas applicable to a variety of needs rather than on a single design for a single purpose. It is apparent that the work may find application to a variety of structures necessary for the early operations connected with space manufacturing, and, as efficiency always will be of importance for certain kinds of operations, the formulas derived should have permanent value. For definiteness, examples appropriate to the early agricultural areas and to transitional structures, possibly optimum for the earliest habitats, will be quoted. Appendix: Observable Effects in and Human Adaptation to Rotating Environments. Gerard K. O’Neill, Princeton University; Gerald W. Driggers, Science Applications Inc.
Abstract: The observable results of motion within a rotating environment where pseudogravity is created via centripetal acceleration are often misunderstood. Likewise, the reaction of humans to head motions within this same environment often is not postulated on the basis of existing experimental experience. The first item can be addressed on the basis of simple physical modeling. Extensive research remains to be done on human reactions before final conclusions based on a strong statistical base can be drawn. The available data indicate that a healthy person can adapt readily to 5 rpm or more.